TJ's have other options available such as Tool Sheds, Glory Boxes, Hipex Shed (a mixture of an Apex and a Pent garden shed). Also within this section you will find a design called a Potting Shed which is a mixture of a greenhouse and a garden shed and there are also the more larger garden sheds called a workshop, perfect combination of a storage building and workshop. At TJ's we only sell high quality timber products, the timber is tongued and grooved board and the floors and ceilings are matchboard. Our sheds are stained with a water based treatment, you will not have to re-treat your shed for at least 12 months or earlier if you wish. If you would prefer not to have to maintain the timber protection we also offer a range of pressure treated sheds. We have a variety of timber thickness and framework to suit all needs, if you have any questions please call one of our team who will be happy to provide you with further guidance. A detailed specification is listed with each model shown. FITTING IS INCLUDED IN THE PRICES SHOWN within in a specified radius, please see terms and conditions for further information. If your post code is out of area please get in touch to receive a quotation for fitting. The Glory Box is ideal for storage and general household uses, where space is limited 16mm Ton.. The Glory Box is ideal for storage and general household uses and bike storage where space is l.. The Hipex Shed is an Apex / Pent combination shed ideal for storage and general household uses. ..
2 x 2 Framework Available in 16mm or 22mm Tongued and Grooved Board, 19mm Barrel Board A.. 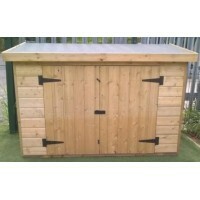 The Tool Shed is ideal for storage and general household uses 5' x 3' with 5'3" Eaves and 5'6".. The Apex Tool Tower is ideal for storage and general household uses, where space is limited. A.. 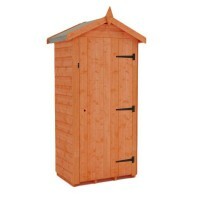 The Workshop double doored shed is ideal for storage and general household uses. 2 x 2 Framewo..